Simple Country Living. 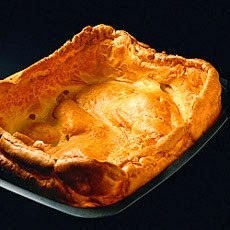 : The Great Yorkshire Pudding Disaster ......... AGAIN!!!!! The Great Yorkshire Pudding Disaster ......... AGAIN!!!!! Anyway, this weekend, while I was roasting the leg of lamb we were having for lunch, along with cooking all the veg, I was panic-stricken to discover that I had completely run out of the frozen puds that I usually use. No problem, I thought, I will just make some. It will be fine, I said, I can do this. Turns out ........ I am STILL hopeless at making YorkshireBloodyPuddings!!!!!! The frustrating thing is, I don't even know what I'm doing wrong. They taste ok. The problem is they just don't rise. They are flat as pancakes. In fact I could use them as frisbee's. Anyway, after the latest Pudding Palaver, I have vowed to become the Queen of Yorkshire Puddings and have thus warned my daughter accordingly ........ I will be making them every day until I get it right and she will be my chief taster. And sadly no, this is NOT one I made earlier, I got this picture from the internet (it's a Delia Smith creation) but essentially ... this is what I am striving for. I use much the same amounts as you but use milk and water half and half, I beat the eggs and liquid together and then whisk in the flour. I use dripping or lard in my tin and have it smoking hot, I stand it on a hot ring to fill. Then into a hot oven and do not open the door until it is high and golden brown. For Toad in the Hole I brown the sausages in the tin for 5 to 10 minutes and proceed as above. I do let my batter rest for at least an hour before cooking, just give it a quick whisk first. That Yorkshire Pudding looks just like the ones my Mum and Grandma used to make - I am from Sheffield too. My Grandma used to stand at the back door when beating the batter to get more air in it and added dried sage and grated onion to hers - totally delicious. I don't measure anything but do it by eye like my Mum did using half milk and water to the flour and egg. As long as the dripping is really smoking hot when you pour the batter in you shouldn't have a problem with it rising. Famous last words! I use an old Nigella recipe, mix the dry & wet ingredients separately. Leave separate for 1/2 an hour mix, leave again for 1/2 an hour. Then pour into hot oil & straight into a hot oven. Found in my Mums old cookbook, she used to make the real ones every week. Hope it works for you. Preheat Gas 8, 230c for 20 mins for smalls, 30 mins for large. The scary bit for me is waiting for the fat in the tins to heat up enough. The mix is same as pancakes so needs a 'fry' effect to start them off. Have tried with veg oil but they turn out too soft and wimpy! Oh, and my Mum is Liverpudlian and I am Yorkshire! My first thought when I saw your recipe was ,"Too many eggs!" And use lard, not oil. Get the lard really, really hot before pouring the rested batter into the tin(s)and you will have risen, crisp Yorkshires every time. Kay, I think there is nothing wrong with your recipe but I must admit I do tend to do everything that Pam suggested and they rarely fail. whisk all together 'til nice and fluffy and pour into tin (either one large tin or individual 12 hole tin), making sure there's oil (I use sunflower) in the bottom and it's sizzling hot. Sorry, I certainly don't have any knowledge about Yorkshire Puddings and thought that it was a flour, milk and maybe egg mixture that was set underneath the meat that was being roasted so that the drippings fell onto it and made sort of a soft bready like thing to eat with dinner. Where did I get that idea? From reading novels set in England and not properly researched? Most confused here in the U.S.
How do you eat it? Is it to be filled with something like a little tart (the picture you showed looked sort of like a little pie crust or tart shell) or do you break it up and eat it like bread. Silly me, silly question. Answer only if you have time out from baking all these test models. Good luck. It has been my experience that things never taste as good as when our mothers made them. I make the batter by hand with a balloon whisk and it normally stands around for a couple of hours, but the recipe says it doesn't need to. I then put a small amount of dripping into each hole of a muffin tin, get it really hot and then pour the batter in. The oven needs to be really hot 220 degrees C/425 degrees F/Gas Mark 7. They cook in about 25 minutes! Hope you have some luck! Just found your blog and really enjoying it.. Love blogs from the UK. I live across the pond..
Hi. I use Delia's recipe too. My Delia book says to cook it in a shallow tin (swiss roll tin) and when I do that, I've never had a failure. If I try and cook the mixture in muffin tins, then I get pancakes. I don't understand why but now I just keep to my shallow tin and cook one large pudding. Hope it goes right for you.